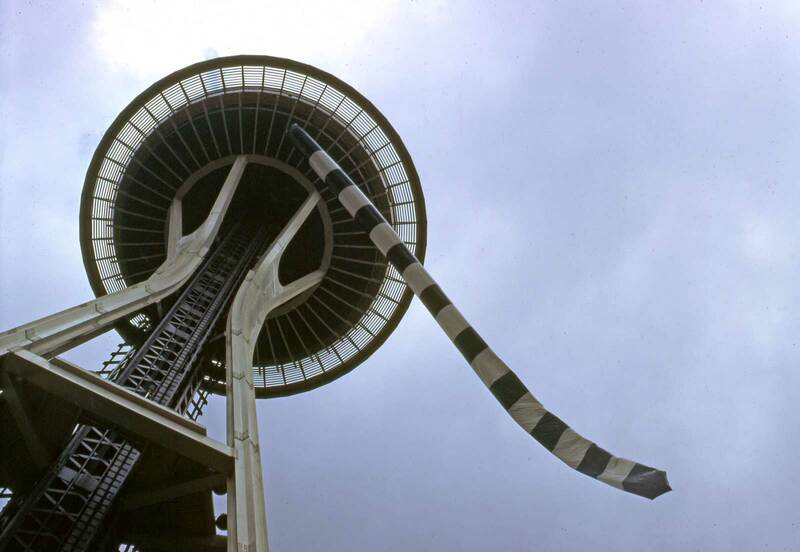 NOW: Jean last visited the Space Needle in 2011. Stirred by the changes, he makes note that “There are six cranes at work in mid-ground, say north of Stewart Street. 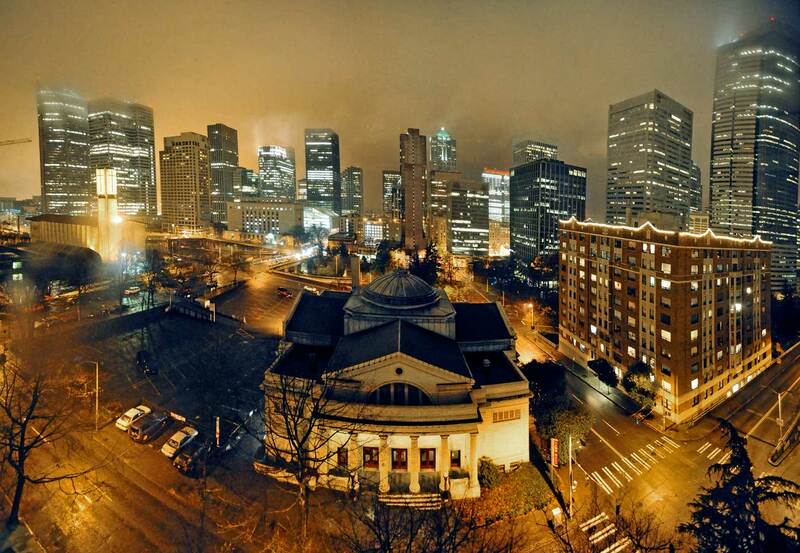 The old dip in the cityscape between the Smith Tower and the Space Needle is filling in. We are spawning towers.” For their “hide and seek,” readers may wish to visit Jean’s and my blog dorpatsherrardlomont to study enlarged copies of this week’s featured subjects and more Seattle cityscapes from the Needle. Here is an opportunity for readers to enjoy our deeply human urge to play hide and seek. What is often made of bricks and tiles in the “then” panorama may still be discovered beside or behind the grand expanse of glass rising so high in the “now.” You may wish to start with the Smith Tower. Only a slice of that 1914 landmark can be found far down Second Avenue on the right. 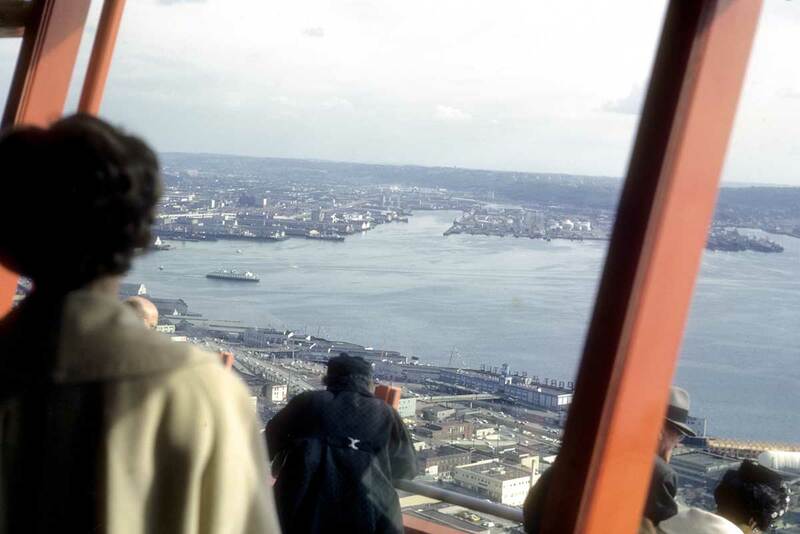 Both views, of course, were photographed from the Space Needle. 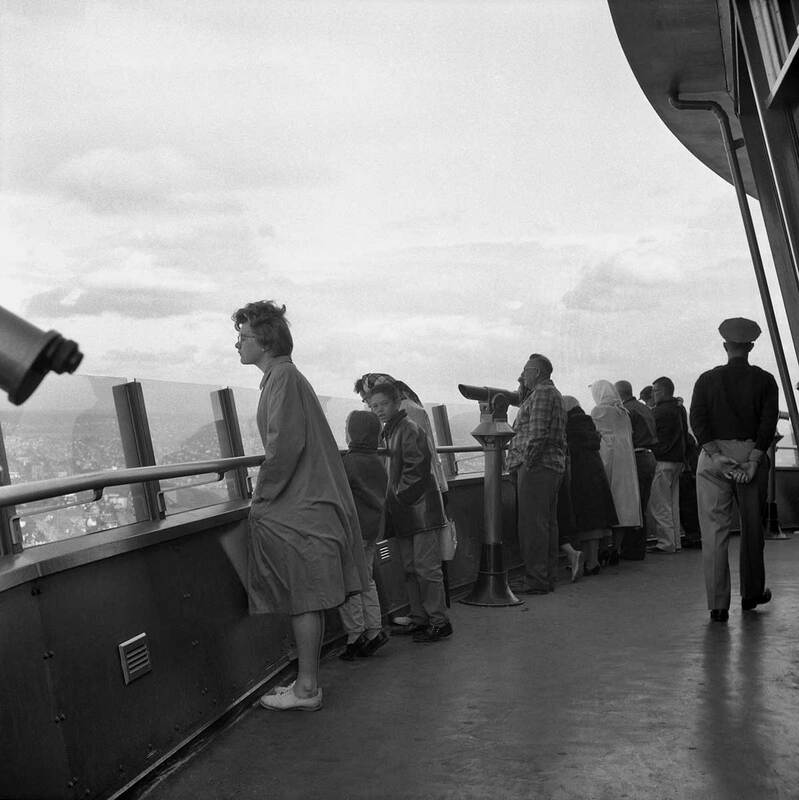 The historical photographer exposed his or her Kodachrome slide in 1962 when the Space Needle was new. Jean Sherrard recorded his digital repeat late last February, on a perfect day for photography when that winter light with its soft shadows is so forgiving and revealing. In the upper-right corner of Jean’s repeat, a crisp Mt. Rainier reflects the afternoon sun so that the name, “The Mountain that was God,” seems most appropriate. When Seattle and Tacoma were still arguing whether it should be named Mt. Rainier or Mt. Tacoma, this sublime substitute was used, in part, to transcend the promotional rancor bouncing back and forth between the two cities. 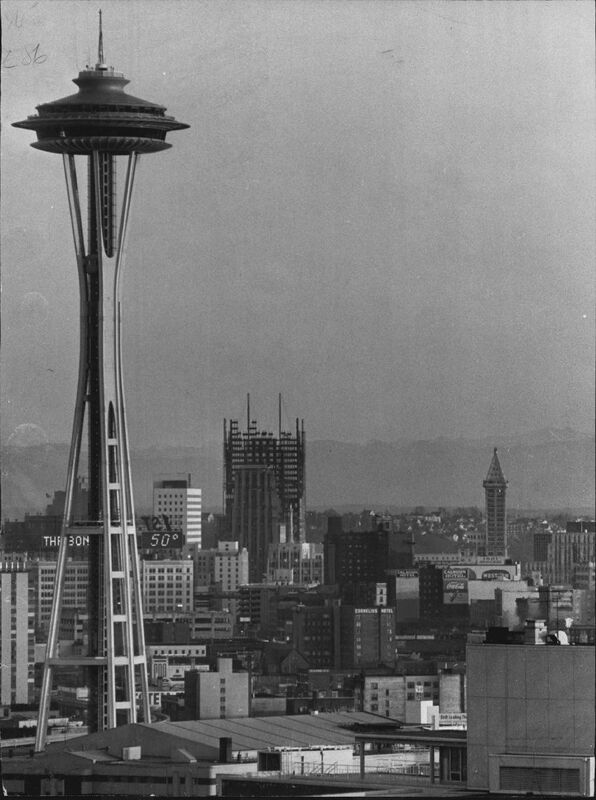 For the more ancient among us, the 1962 panorama may reflect The Seattle Times now long-passed columnist Emmett Watson’s campaign for a “Lesser Seattle.” Watson, with the help of rain and this modest skyline, hoped to discourage Californians from visiting, or worse, staying in Seattle. 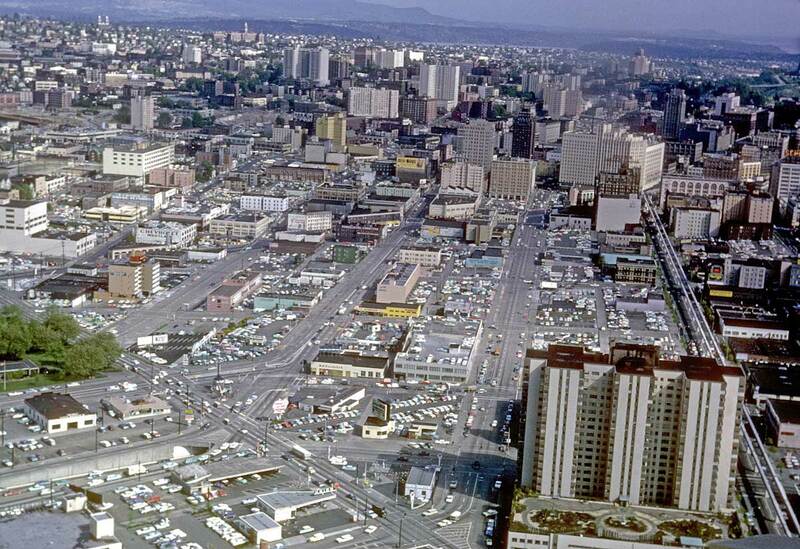 This was the Central Business District before major leagues, digital commerce, grunge, and acres of tinted glass curtains. Seek and you may still find the Seattle Tower (1928), the Medical Dental Building (1925), and the Roosevelt Hotel (1929), but not the nearly new Horizon House (1961) on First Hill, here hidden behind many newer towers. Some of the Century 21 parking in the Denny Regrade neighborhood. Notes the fancy foot landscaping on the lower “wing” of the Grosvenor House, bottom-right. 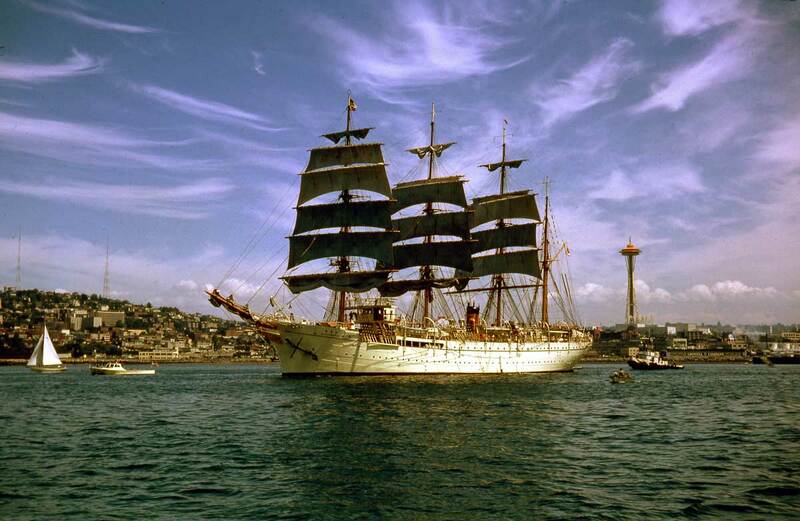 Lawton Gowey’s ecstatic portrait of the bark Nippon Maru with the new Needle off its stern on June 20, 1962. Seattle Times photographer Josef Scaylea’s contribution to the United States Information Agency’s Russian Language periodical. The original is in color and may redeem it. 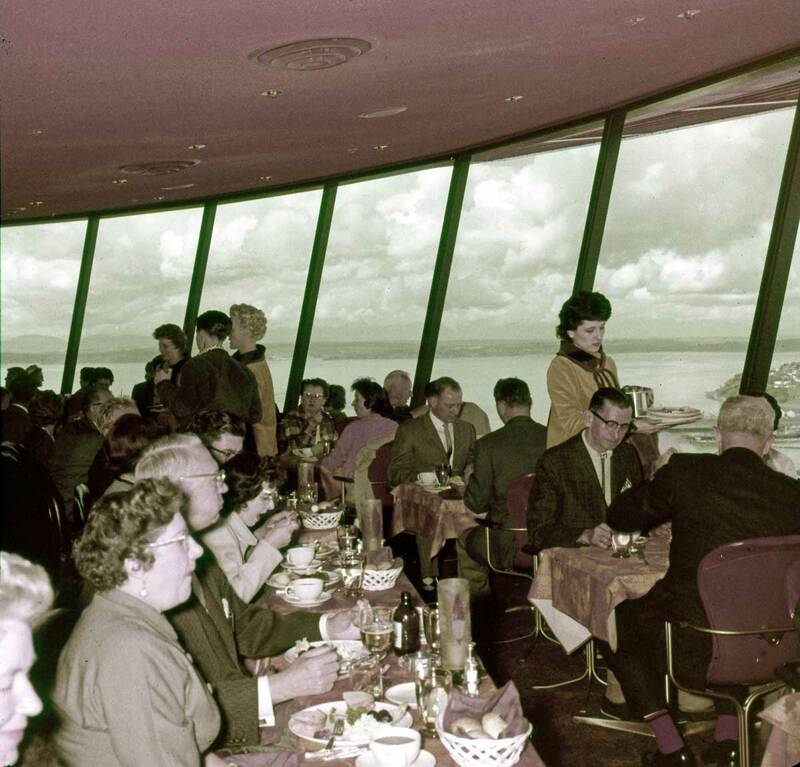 Ivar Haglund’s Century 21 Fish Bar as foundation for the Space Needle. 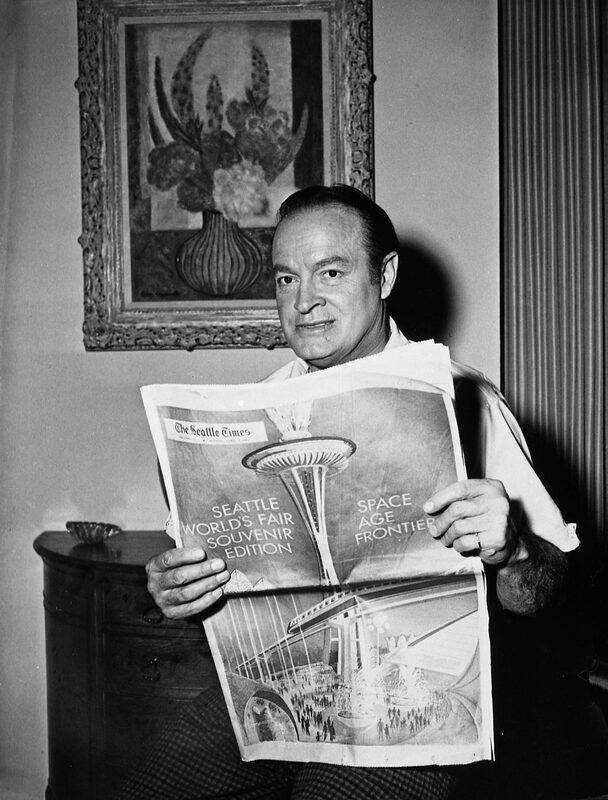 Bob Hope diverted from reading about the fair and its splendid Space Needle in The Seattle Times special edition. 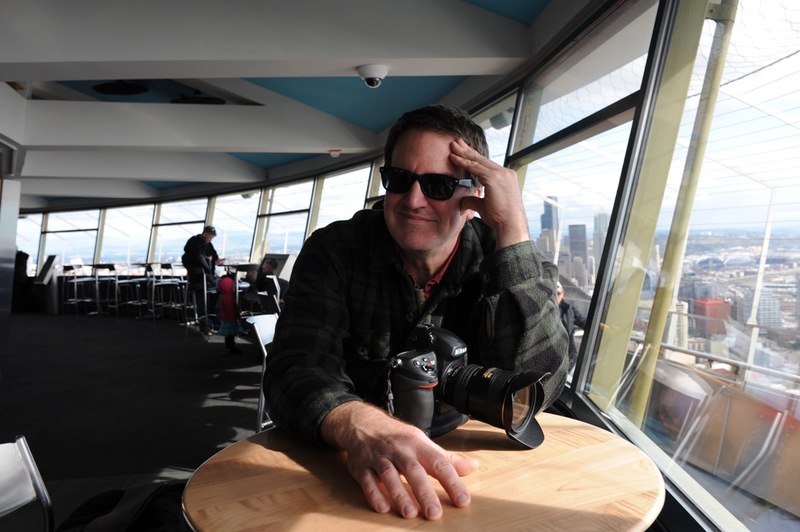 Jean resting with his Nikon at the top of the Space Needle. 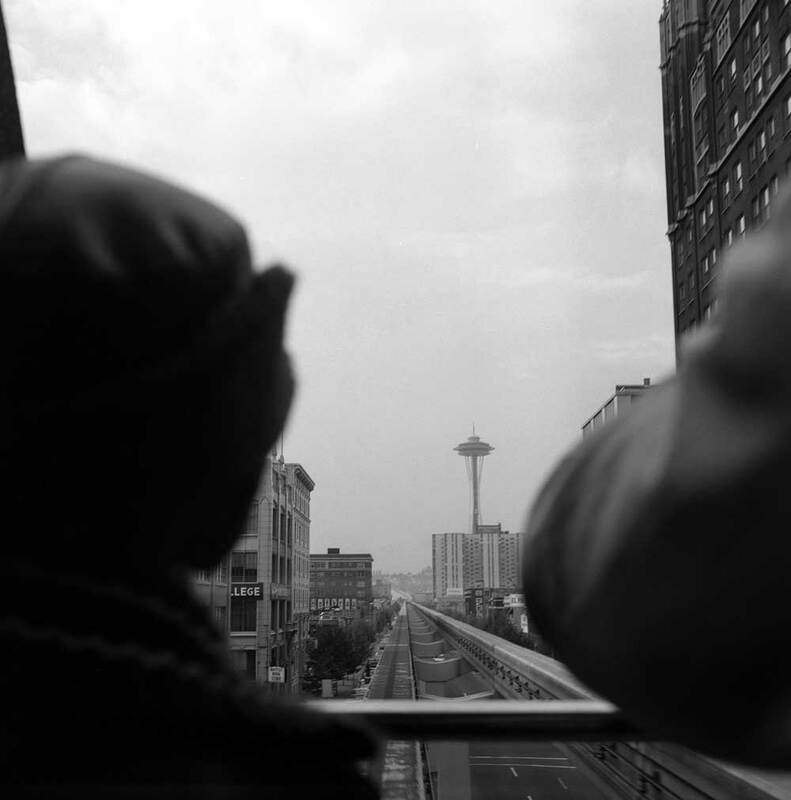 This may have been taken by Berangere during her last visit to Seattle. Jean will correct me if I am wrong. Anything to add, Paul? Assuredly Jean – and with your help: your’s and Ron’s. First Ron’s. 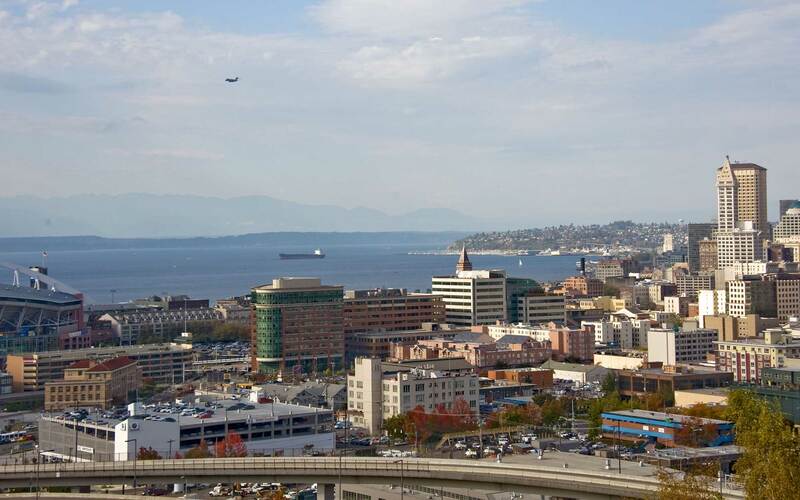 Directly below are three links to landmarks that can still be found in our cityscape, and appear – in part – from the Space Needle. Next, we will put up some examples of pans from favored Seattle prospects. 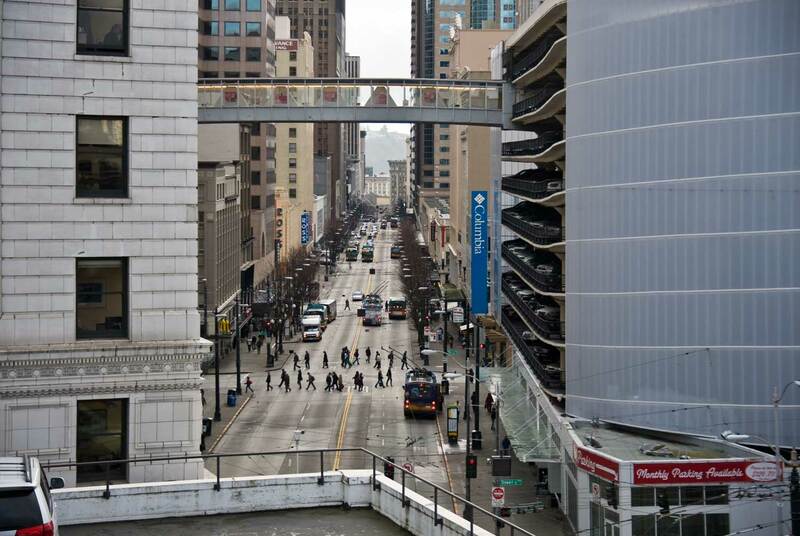 This will not be a surprise to you, because you have recorded repeats for most of them, and when you arise on Sunday morning – after breakfast – you may, we hope, pair these distinguish Seattle examples of panoramas with your own contemporary repeats. As time allows this evening, following those “classic” now-thens, I’ll put up some other wide-angle shots from hither and thither, reaching as far as your family’s favored summer destination: LaPush on the Washington Coast. Frank LaRoche’s ca. 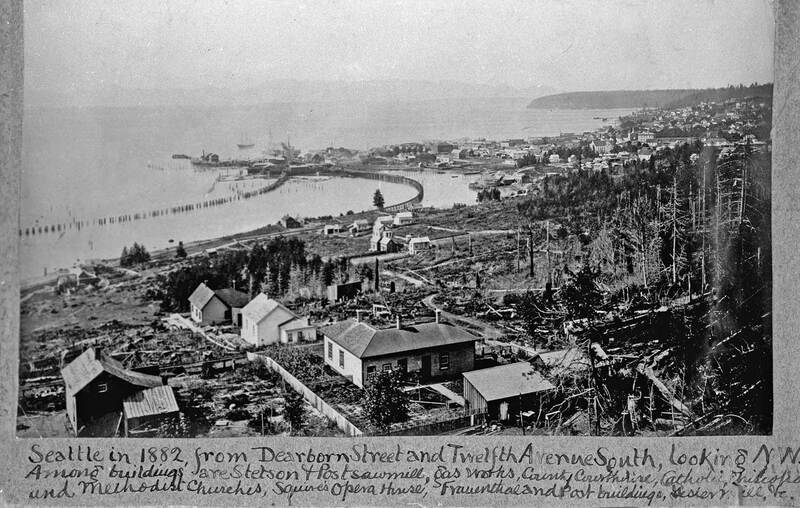 1891 look south down Third Ave. from the Denny Hotel construction site on the south summit of Denny Hill. On the left are the Methodists at the southeast corner of Pine Street and Third Avenue. The oldest pan of Seattle among the many taken from Denny Hill by Moore. The date is 1871/2. The summit of First Hill, far left, is still forested beyond the Territorial University campus. The King Street Coal Wharf is still five or six years from construction. Pike Street crosses left-right/east-west beyond the fence. Beacon Hill marks most of the horizon. Second Avenue continues south beyond the shed’s roof. 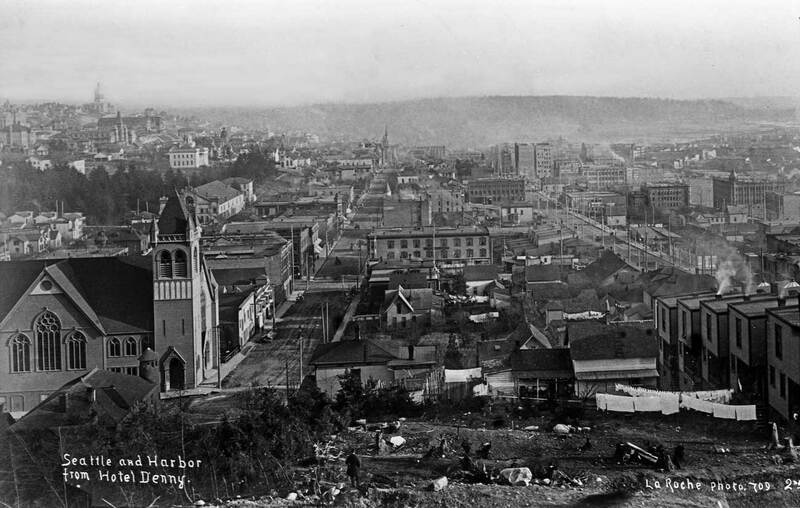 The title for his centerfold to a late 1880s book of Seattle scenes is evidence of Arthur Denny’s intentions them to root the state capitol away from Olympia and plant in on his hill that would, after his kidnapping failure, be named Denny Hill for him. 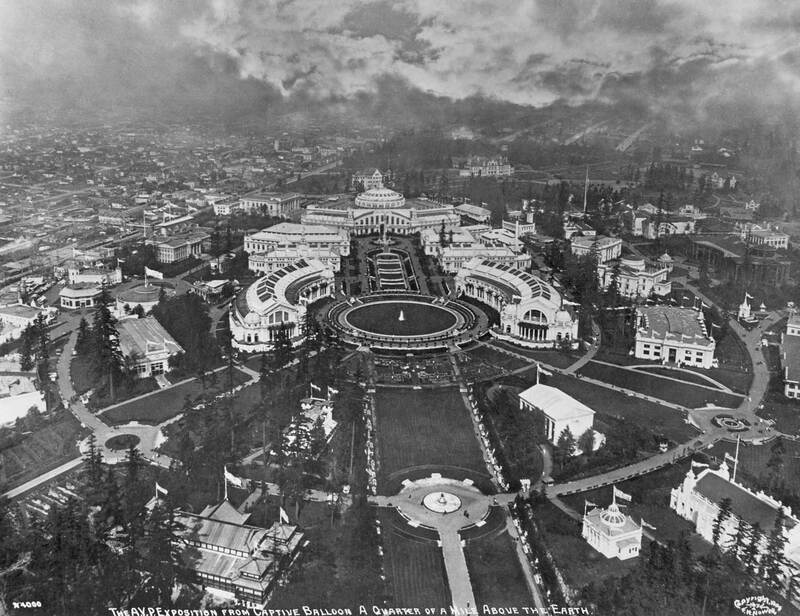 Webster and Stevens Studio three-part pan of First Hill from the nearly completed Smith Tower in 1913 or early 1914. Courtesy, MOHAI. 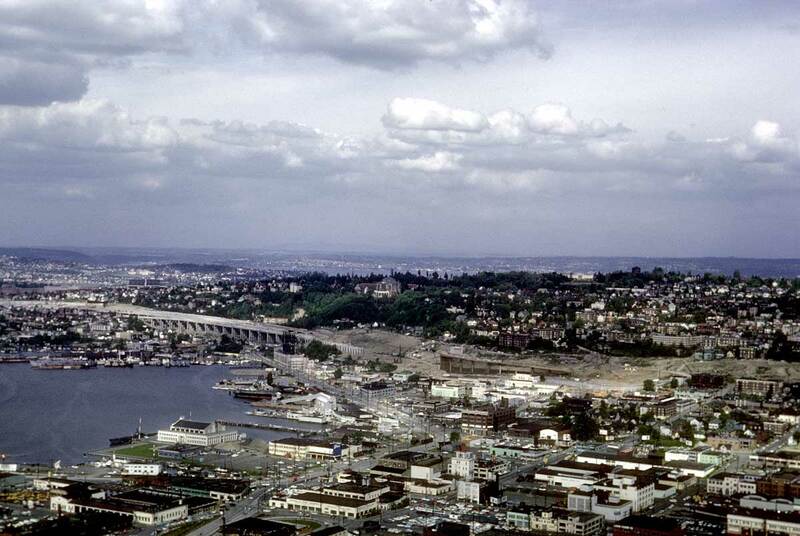 A merging of Lawton Gowey’s two-part pan of the tideflats taken from Beacon Hill in 1968. Note the rising SeaFirst tower on the far right. An A. Curtis 1903 pan looking west over Green Lake to Phinney Ridge with an Olympic Mountains horizon. This is but two parts of a pan that continues for another third into Wallingford, here out-of-frame to the left. 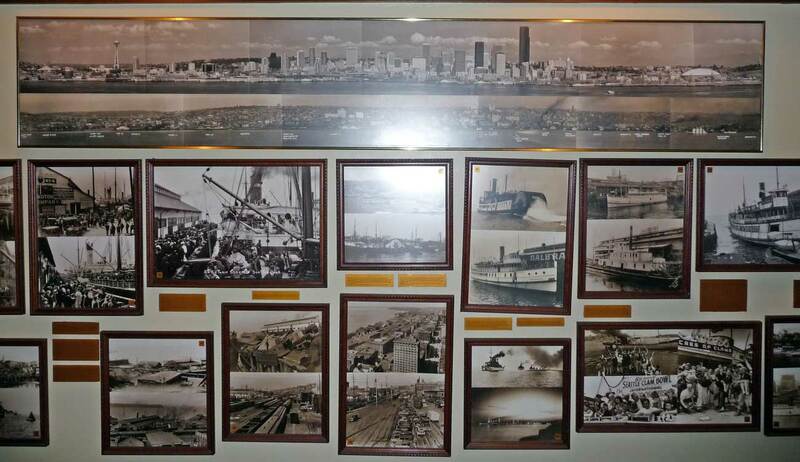 SEATTLE’S FIRST PANORAMA, by Sammis. 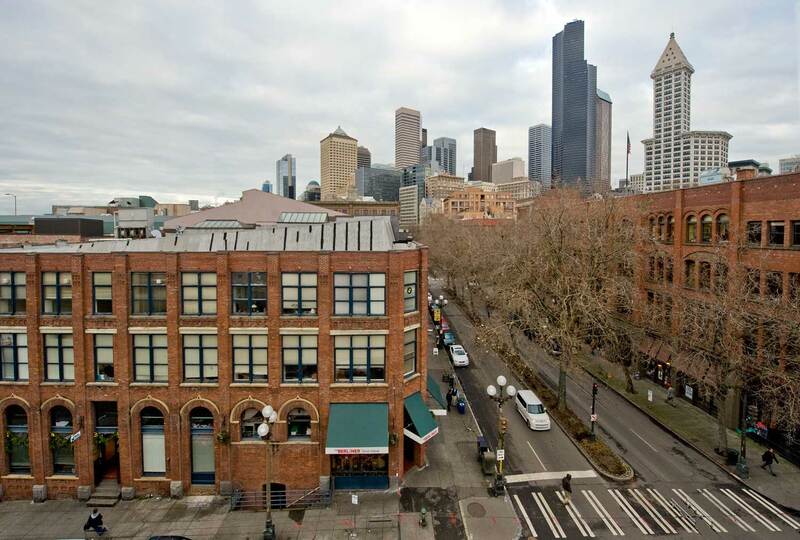 Taken from the second floor of Snoqualmie Hall at the southwest corner of Main Street and Commercial Street, long since renamed First Avenue South. 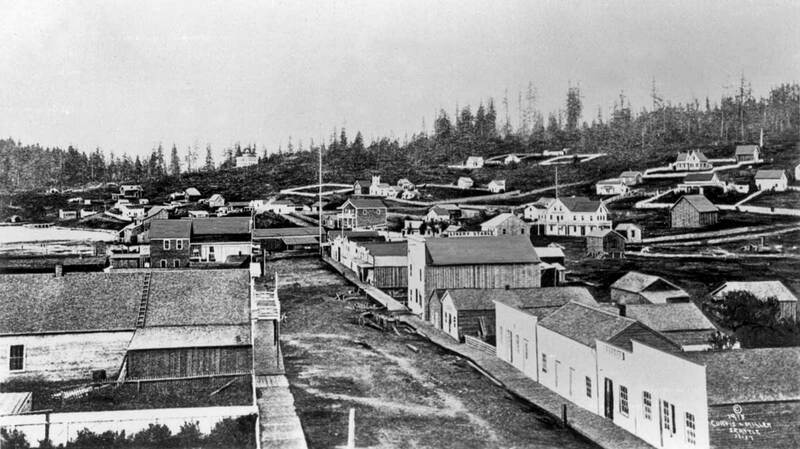 North along the waterfront before the city’s “Great Fire of 1889,” taken from the end of the King Street Coal Wharf. Knit from three photographs of the Seattle Waterfront in 1878 taken from Yesler’s Wharf. The nearly fresh 1876 grading of Front Street (First Avenue) is evident. Denny Hill, with its two summits, is far left. The broken ship Windward is anchored at the center. Above it is the foot of Madison Street, and then on the horizon the Territorial University at 4th and Seneca. Columbia Street reaches Front Street far right. Yesler’s millpond is scattered about. “Look! Up in the Sky” the tethered balloon on the right. Several aerials of the AYP captured campus and beyond were taken from its basket – like those below. Looking south over Portage Bay to Capitol Hill. Montlake is on the left. The Latona Bridge is on the far right. The AYP’S “ARCTIC CIRCLE” with part of the University District on the left. RETURNING TO THE NEEDLE – ANOTHER INFLATABLE. A 200-foot long inflatable or soft sculpture commemorating a common feature in the art of several artists very loosely connected with the Shazzam Society in the late 1960s and here into the early 1970s. (For the moment, I do not remember the year. 1971 or 1973, I think.) At the time I was preparing a film, Sky River Rock Fire, most of the footage for which was taken at the several music festivals hereabouts in the late 1960s and early 1970s. Here I joined with the crafty help of the Land Truth Circus and its grandee, John Hillding, to raise this UNIVERSAL WORM (aka tiger’s tale) to the rim of the Space Needle where a gust of spring air suddenly threw it below the restaurant where it was penetrated or punctured by the concrete “ribbing” (or spokes) there and returned to earth flapping. 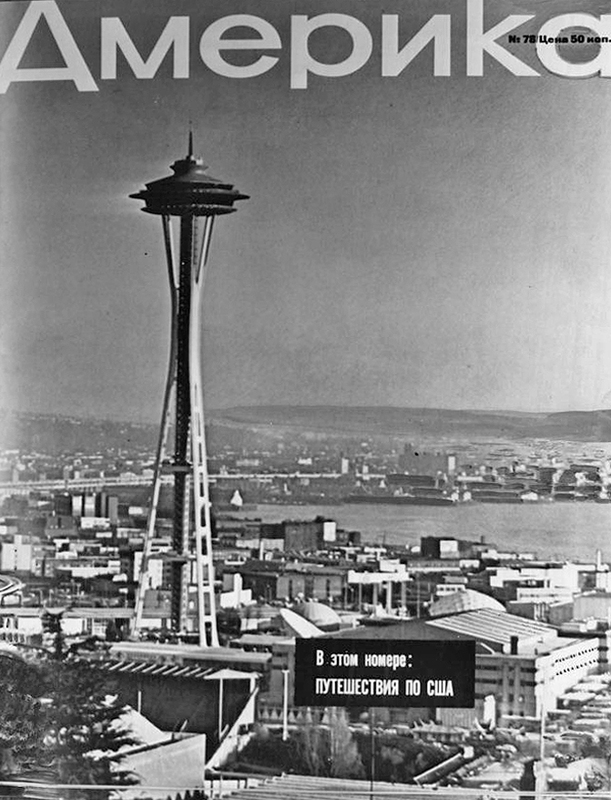 In your latest Now & Then you show a 1962 picture from the space needle with a large reader board displaying “Optometrist” on top of a building just to the right of center in the picture. Is that actual or added after the photo was taken? If it is actually real do you know the origin of why or how?